In 2017, Melbourne audiences chortled and guffawed – no doubt at times even choked on their own windpipes – through the hilarity that was The Play That Goes Wrong. It wasn’t the first farce of that year but it was by far the best, leaving local efforts like The Homosexuals and Noises Off for dead. The question is, can the producers step into the same river twice? 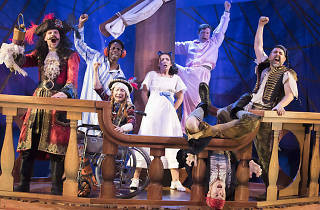 Peter Pan Goes Wrong promises to up the laughs and the chaos, to be more wrong than the previous play that went wrong. Does it succeed at being a bigger failure? Perhaps not, but it’s certainly fun watching it try. It starts very much like its predecessor, with “stage hands” mugging and ad-libbing their way around the auditorium. Of course, this seeming looseness is actually extremely calculating, lubing us up, getting us in the mood for the riot and mayhem to follow. It’s only when the director Chris Bean (Connor Crawford) comes out, with his assistant/co director Robert (Luke Joslin), that we begin to sense the tensions underpinning this theatrical endeavour. We launch quickly into the production of Peter Pan itself, and within minutes we realise it’s a production that is doomed. Doomed for the actors, directors and producers; comedy gold for us. Anyone who saw The Play That Goes Wrong will recognise the beats, the set-ups and even the specific gags that made that show so funny. What’s remarkable is how amusing it is the second time around. Things fall off walls or out of the flies a lot; actors who forget their lines ensnare other actors in maddening loops of forgetfulness; sound effects, props and cues never come off as intended. There are innovations too: the dazzlingly quick costume changes that become impossible to pull off; the audio recordings of past auditions that reveal compromising cast secrets; the added hilarity of flying actors who bring exquisite panache to the art of crashing. It’s only a pity that the architecture of the play isn’t as sharp as last time. Farce is an exercise in impeccable dramatic design: visual gags need repetitions that end in a twist; word play needs to feed into the larger plot, or at least open out in unexpected ways; and all paths need to lead to a single chaos. 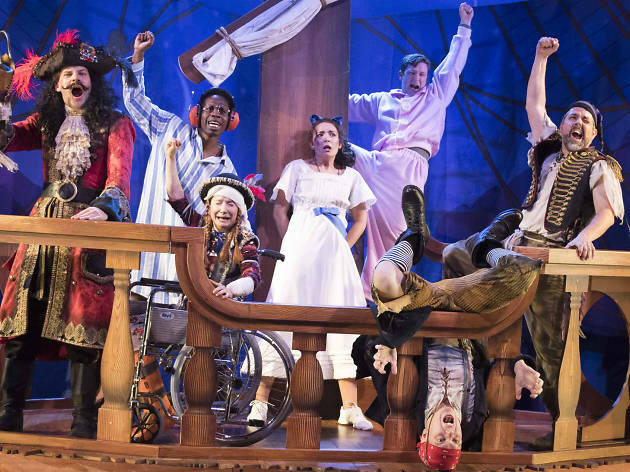 Peter Pan Goes Wrong lays down a lot of the foundation of farce, but it squibs on the pay-off. After a pretty strong first act, it leans largely on its rapidly revolving set and a vaguely defined notion of silliness to get it through the second. Thankfully, the cast are as impeccable as before. Jay Laga’aia is the most famous, and he’s certainly adorably put upon as the narrator, but other actors shine just as much. Francine Cain hilariously tries to turn Wendy into a one-woman cast of A Chorus Line, shimmying to every line. Jordan Prosser is a winning, grinning Michael, and George Kemp turns the excruciatingly dim-witted actor playing John into a subplot of his own. Best of all are Connor Crawford as the director/Darling Patriarch/Captain Hook – who uses all three roles to build a figure of gloriously waning authority – and Tammy Weller as Mary Darling/Tinker Bell/Tiger Lilly, an exercise in tireless persistence in the face of grave danger. This kind of inanity is only as fun as it is because of the surgeon-like precision involved in making it look so haphazard. The production is in some ways more ambitious than The Play That Goes Wrong, certainly technically and logistically. It’s a pity, therefore, that the play itself isn’t quite as good. The surface mayhem isn’t mirrored in the interpersonal mayhem, so that the two streams seem to operate irrespective of, or at best concurrent to, each other. The clockwork genius of farce is watered down here, and the worry is that subsequent iterations will prove the law of diminishing returns. This is still funny, and perfect fare for kids and adults alike, but it might be better to retire the concept before it peters out altogether.